BKF File Viewer is one of the best software to read .bkf files of microsoft windows 10, 8, 7 or earlier editions. This freeware bkf viewer scans the less as well as highly corrupted backup (.bkf) file and opens the bkf file documents to provide the preview of each document. Supports to load & open .bkf files and .zip files. Quick and deep scanning mode to repair less & highly corrupted bkf file respectively. Provide complete preview of bkf file documents after scanning. Search option to find items within scanned bkf file. Allows to sort order of bkf file items according to size or date. BKF file viewer can be upgraded to its pro version. 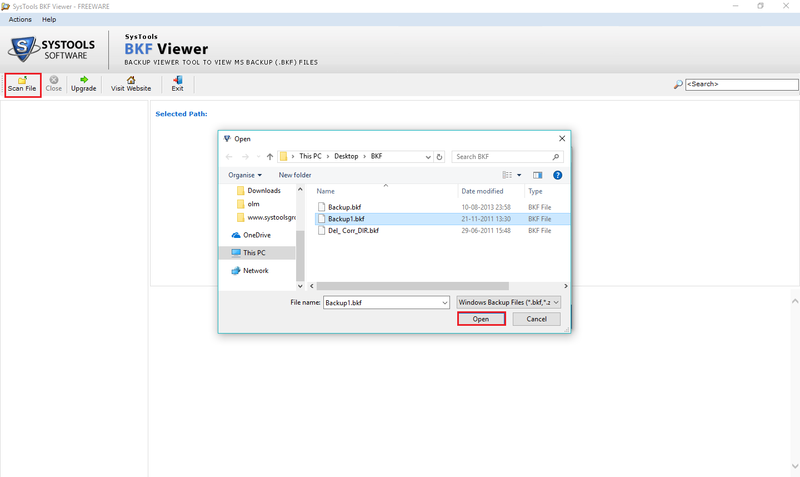 Microsoft BKF viewer software allows users to browse for .bkf files or zip files. This bkf reader tool is helpful to open any inaccessible bkf files in windows 10, 8, 7 etc which are created by NTbackup utility of Windows NT series & Symantec Backup exec of Windows above NT. To read the inaccessible bkf file items, there are three scanning modes in bkf backup file reader. 1. Quick scan: This scanning mode is used if the chosen bkf file has less or minimum corruption. 2. Deep scan: This is an advanced scanning mode used for highly corrupted bkf files. 3. Range based scan: This scan mode is used to extract file(s) from certain portion of backup file bkf. 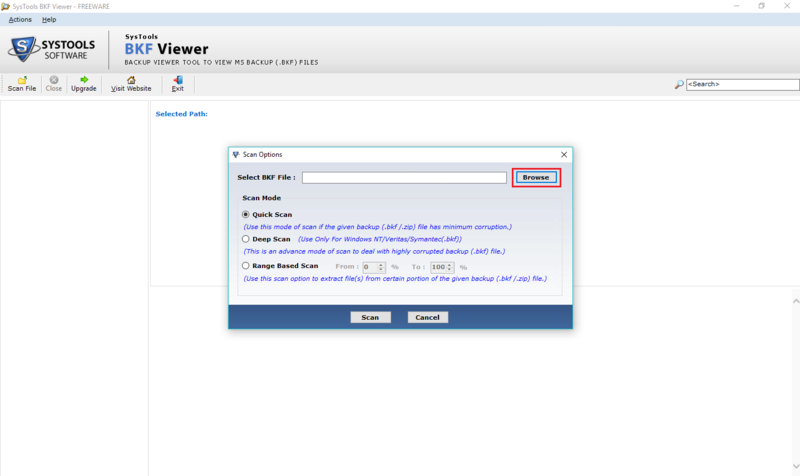 BKF Viewer tool is provided with the search tool bar. This search bar helps the users to find out any specific items from the listed item or scanned bkf file. User can search by typing the file extension or phrase, the tool will lists all the matched results. After completion of scan process, the tool provides an instant preview of all BKF file items. This BKF reader freeware tool previews the items with all its attributes such as file names, file size in kb, modified date and time. 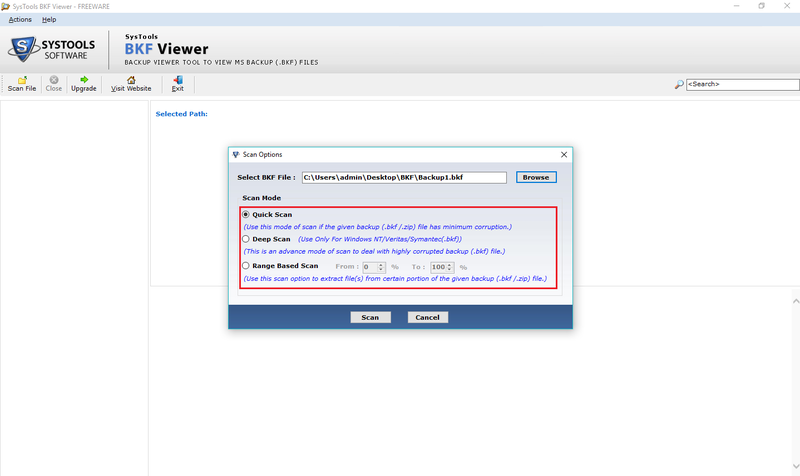 BKF Viewer has a separate preview pane. BKF files are the backup created on windows XP which makes it difficult to open or view or restoring it on windows 10, 8, 7 OS. BKF file reader is helpful in these situation which allows to open and view either healthy or corrupted bkf files without any condition. 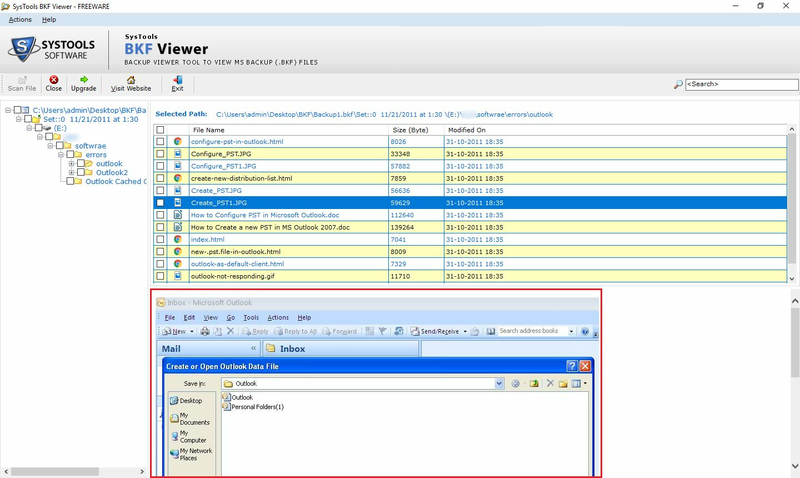 BKF viewer is a portable tool to open and read BKF file items. Also it has a simple user interface, user not needed to be technical expertise to run this tool and it has not any system pre-requisites. BKF backup file reader has simple working with user friendly interface. "Previously When I was using Window NT version, I created the backup file stored with .bkf extension. Now I have updated my OS with Windows 8 but found this bkf file non-accessible. Then I got this BKF viewer software which allows to easily open bkf files." "The Window backup file which I was created last month got highly corrupted because of that it got inaccessible in the system. BKF file reader is an efficient software which scans it deeply and open and view the bkf files items. All thanks to its development team." BKF files are called Windows backup file. The backup file of Microsoft Windows NT to Windows XP version created by its built-in backup application NTBackup ends with .bkf extension. After the Windows NT series, Veritas Backup utility currently known as Symantec Backup Exec creates the BKF files. The BKF file is used to backup & restore files or data on computer. It is also called as NTBackup File. Backing up of database is needed and much important for running any business to keep the data safe. There may be need to restore this data backup in case of data lost due to hard drive crash or virus attack or of any other reasons. How to Restore & View a BKF File? As we know the bkf file which was created in Window NT or Xp is not accessible in any other Windows version. 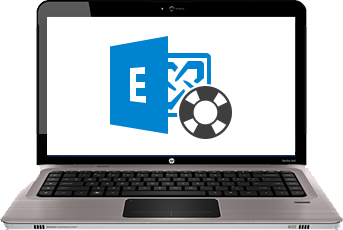 Therefore, to open and restore the created bkf file in Windows 10, 8, 7, vista etc, an Ntbackup utility is needed. This free bkf viewer is very much helpful for opening and reading the healthy as well as corrupted bkf file.